I had one of the best weekends this past week and we are just in week two of summer break. Thursday, I joined a friend for free music at a regular event held here in my city. The band was good but the lead vocalist was horrific! We ended up at Bahama Mama where we dined, had a beverage and watched the first half of the playoffs. You glad it is over too? I can’t be happier. I thought I would need to delete my Twitter. Friday night I went out with my niece’s mom (she’s a single mom too) and a good friend who encouraged me to birth this blog. Roodlyn the creator of www.supermomplace.com. We hit my favorite boulevard; where we dined and danced at Mangos. I found this dress during GAP’s 40% off sale. The color was a winner. I’m a red fan, the cut of the neckline was different from any dress I have in my closet and I have a lot of dresses. I’ve only worn these shoes from Bakers a few times with a deep purple sheath dress from Target. I realize the reds weren’t the same but I’m not a matchy match person. Besides, I’m expressing my own style and I liked it. There was a bachelorette party going on and can I tell you that I kept saying while on the dance floor that the bride to be was working it so that her fiance probably was going to leave her at the altar if he saw the pictures when she got home. She was all on the floor, leaning back, dress too short and drunk as 10 skunks. Please don't every allow me to carry on in this manner. I was totally embarrassed for her and her friends. 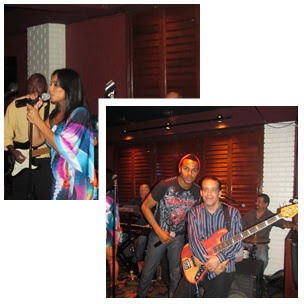 Even the male band member pictured next to the guitarist kept giving Roodlyn and me the 'WTH' look. Those chicks needed a chaperon. Glad I wasn't driving on the same street as them. I am most positive they were past the legal limit. I wanted to tap them on the shoulder and remind them that drinking and driving kills. Young and dumb! During the drunkard silliness, I laughed and laughed at those girls but looking back someone really should have taken their keys and called a cab. Have you ever been in this situation before? Sadly, we don’t get into other folks business like we did back in the day. I’ll be sure to do my part next time even if it is going to the manager and making him or her aware but I was tired, sleepy and irritated after two dudes started spitting lame game (I know not a good excuse). 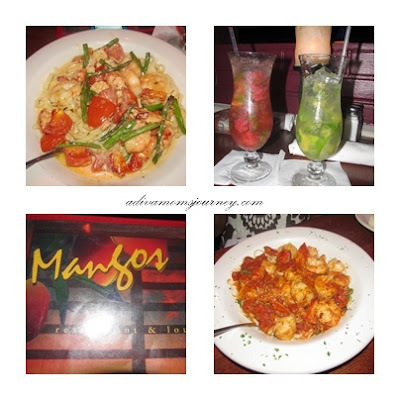 If you are ever in the Ft. Lauderale area check out Mangos. BB and I had the seafood fettuccini and Roodlyn, had something similar but with tomato sauce. We sampled each other’s food and it was all deeelichious. Because you need to know the virgin mojitos were tasty (wink). Have you visited this restaurant before? What else on the menu should I try? Red hot is right! You look great in this dress! 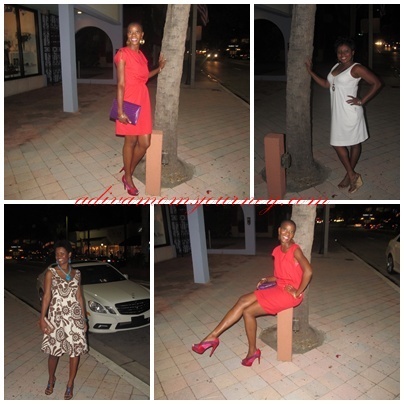 awwww you're making me miss living in Ft Lauderdale - I use to love hanging out on Las Olas. My husband and I would always sit at the outdoor seating at Cheesecake Factory and then go for a walk and watch all the boats go by. Very cute! I love this dress on you! And of course, I love the shoes....Looks like you had a great time. I love the color combo - (dress, shoes, clutch)! The dress is so sleek-- definitely "Red Hot"! love love love, the red and purple combo! this whole outfit is so FAB! Red is definitely your color! You look amazing in that dress. There's nothing like having an outing with your girls. looks like a great time... and I love that dress!! You are always sooooooooooo stunning. I love the clash of pink and red so much. You look hot in that dress. I've always wanted to visit Ft. Lauderdale. @Sacramento, you are too kind. I don't know if I'm always stunning. I just try to post the most flattering photos of myself. @Alissa, come on down. I need to shop and dine and hang out with you.